More to the point I have a fence. 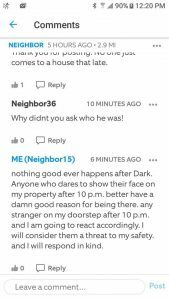 If I catch any stranger jumping my fence after 10 p.m. in the evening??? Well, logic says that they are only there to hurt me. And you know what? I am not their lesser. I am not their victim. they, supposed human being that they are, will not trespass and threatened to lord some kind of false authority over me. they simply won’t be allowed to harm my person in any way! Who are they to do something like that??? Cuz it’s certainly not better off with them, is it? and if I must resort to such extremes… then, yes call me ready.